The Coopered Tot: "Whiskey Women" - the untold story of how Fred Minnick became the new voice of whiskey for a generation. "Whiskey Women" - the untold story of how Fred Minnick became the new voice of whiskey for a generation. "Though industry officials don’t like to talk about it, it’s no secret that one initial aim of the [flavored whiskey] bottlings was to bring women into the whiskey fold. “I do think it’s a major effort to go after female drinkers in an aggressive way,” Mr. [Dave] Pickerell said." This point of view is nothing new. In fact it is very old and well nigh universal - but it doesn't square with a reality where women invented and were the ones to practice the art of brewing beer in the earliest eras of civilization and where women invented the art of distillation and where women were the first and traditional practitioners of the art. Whiskey was born as a home made agricultural product as an outgrowth of the kitchen, and as a medicine that emerged as part of a woman-centered tradition of folk healing. 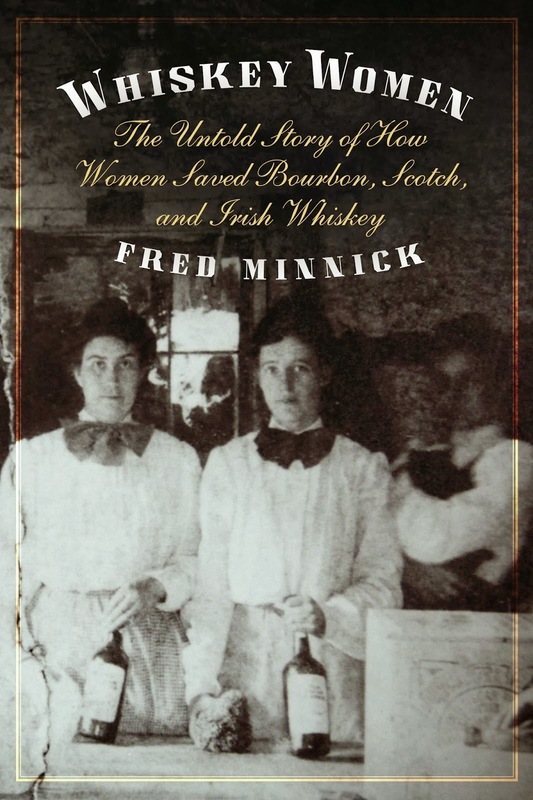 Fred Minnick documents all of this in Whiskey Women in a careful and authoritative way. He does so in a way that isn't all that common in whiskey books. Minnick takes us back to ancient source materials, Sumerian cuneiform tablets, medieval illuminated manuscripts, and a host of other source materials in a mature approach that melds scholarship with journalism. But, as Minnick takes pains to show, this feminine locus of domestic whisky production was a dual edged sword in the culture wars that raged around whiskey in its initial rise from locally produced agricultural product to highly political source of tax revenue and then focus of industrial revolution mechanization and economies of scale. In this era women distillers were demonized, hunted, exploited, and ultimately displaced. Women making whiskey as part of traditional folk healing became connected with witchcraft and women distillers were burned at the stake as witches. In the American culture that followed in the 19th century whiskey become intimately connected with prostitution and gambling and addiction. It was a culture that produced strife and the women-led temperance movement which gave rise to Prohibition. This movement portrayed whiskey as part of a complex of sinful anti-family activity on the part of men that included the image of whiskey bearing women as temptresses. This created the great trope of women in bars as lures to a dissipated and destructive path. This ultimately resulted in general banning of women from working in bars in many parts of the country for decades in the period from Repeal to the 1950s and 60s. Prohibition was a time of organized bootlegging and here women, once again, played a major role. Minnick is on solid ground here with the fantastic stories of lady bootleggers, both high and low such as Gertrude, "Cleo" Lythgoe, "The Queen of the Bootleggers". This stuff is fun. The next historical moment is the movement for Repeal which was also led by a woman, Pauline Sabin. And then the rise of single malt Scotch, greatly influenced by the woman who owned and ran Laphroaig, Bessie Williamson. Bourbon's resurgence is connected with a number of fascinating women, as is the current global explosion of whiskey popularity. We meet women master blenders, executives, brand creators, taste makers, and owners. This cast of characters will be familiar to many whiskey enthusiasts. There's plenty of #WhiskyFabric here. And so we end up in the current day and into the ironic situation where women are becoming leaders of the whiskey world and the bar and cocktail scene and it's presented as though it is a "new thing". Fred Minnick shows us this couldn't be further from the truth. We have it backwards. Women gave whiskey to the world and men took it from them, soiled it with big money, bloodshed, vice and greed and painted it as the very juice of the "Y" chromosome. This is a fictional recasting of what whiskey actually is - something originally made in a kitchen that is part of the attributes of hospitality, medical and emotional care, and social interaction and there is nothing inherently male about any of it. Get inside this idea and you'll understand why the Women In Academia Report listed this book on of the "Recent Books That May Be of Interest to Women Scholars" page. "Whiskey Women" will change the nature of scholarship on the subject and I cannot see how it will not ultimately change the modern view of whisky's history and how it is told in the future. You have to understand that Fred Minnick wears an ascot, loves his bourbon, and has been to war. He is the author of the Iraq war memoir Camera Boy. My point here is that Fred is more than just a guy who loves his bourbon, has been to war serving his country, and who wears an ascot. He's also fast becoming one of the most important voices in America on the topic of America's whiskey. I recommend you start keeping track of him, if you don't already.